Stroll out the back gate down to Dreamtime Beach. Property 18: Stroll out the back gate down to Dreamtime Beach. Property 21: "Hedges Beach View". Property 23: Bliss On The Point family friendly luxury! Property 27: Burleigh Magic. Book Now. 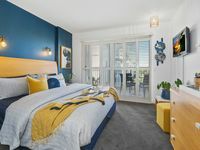 Property 31: Beaches @ Rainbow Bay - Pet Friendly - Min. 3 night stays!